Before I plunge into writing up some posts about Cornwall from our holiday last week, I thought I’d better finish off some of the ones I still have to do from our stay in Somerset a few weeks’ ago. (Too many holidays to keep up with at the moment!) 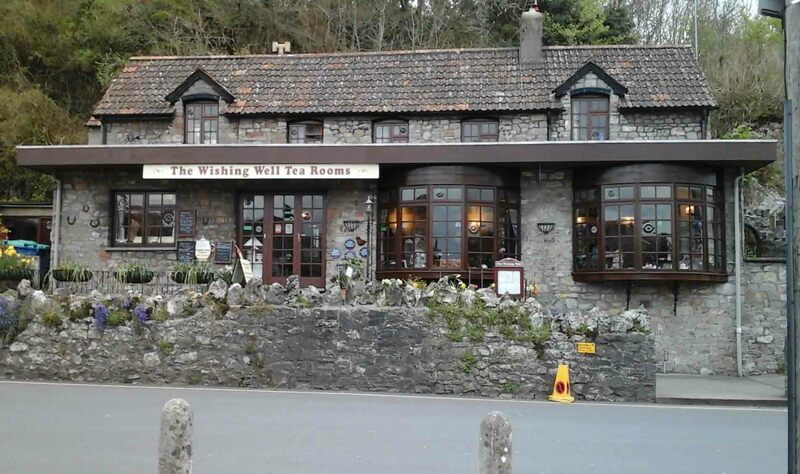 This post is about one of the sites we’d been intending to visit for years – and I’m very glad we eventually made it there. 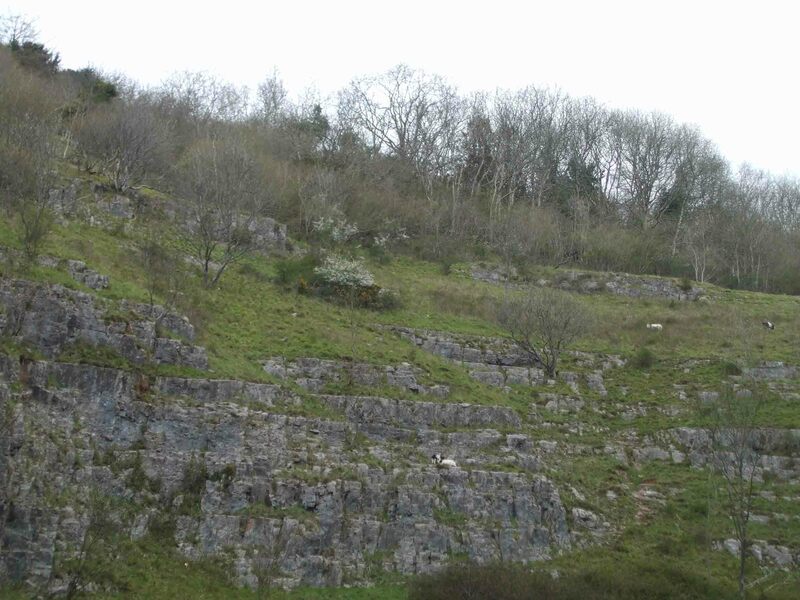 Oddly enough, at the mention of the Cheddar Gorge, most people’s minds turn to cheese. And rightly so. The Gorge’s limestone cliffs rise to 450 feet and the scenery along it is quite beautiful, as well as dramatic. 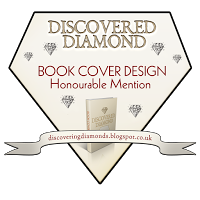 It is an Area of Outstanding Natural Beauty (AONB) and part of a Site of Special Scientific Interest (SSSI). It has been inhabited since the end of the last Ice Age and today, visitors come from all over the world simply to admire the scenery, climb the near-vertical cliffs or cycle along the steep gradients of the road that runs through it (the B1315). Cavers come to explore the many caves, the two largest of which are stalactite caverns and open to the general public. This handsome, 9,000-year-old chap can be seen in Gough’s Cavern (he’s not a real skeleton, of course – just a replica. 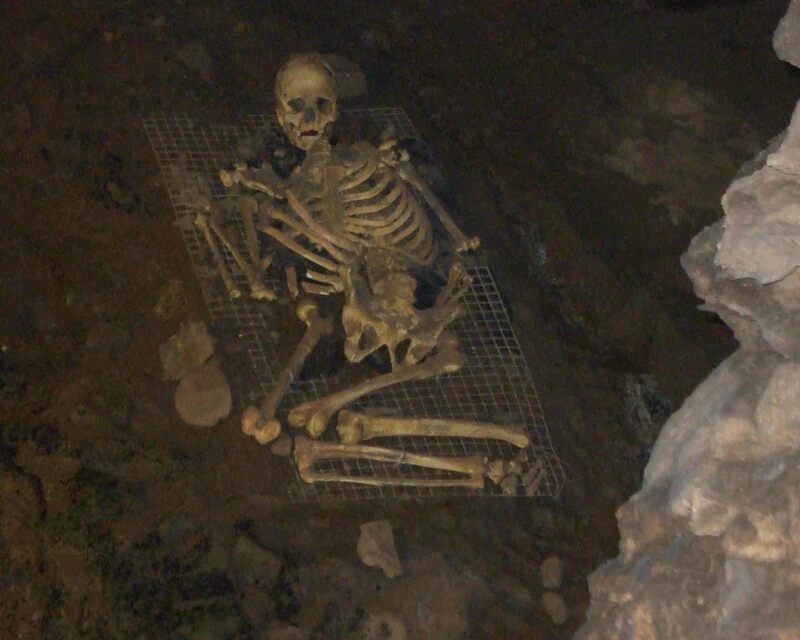 :)) His name is Cheddar Man, whose real skeleton was found in this cave in 1903. I’ll be writing about the two caves in my next post. Ownership of the Gorge is shared by two parties. The south side (where most of the visitor attractions, including the two caves and several tea rooms and cafés, are) is owned and administered by the Marquess of Bath’s Longleat Estate. The north side, where the striking rocks of the Gorge tower alongside the road, is owned by the National Trust. The Gorge was formed about three million years ago when a small river cut through the soft limestone. Thaws of subsequent ice ages increased the flow at times to produce this spectacular natural attraction. You can still see the benign-looking river which now flows underground and appears at the foot of the Gorge. On arrival at the site, we decided to do what many visitors do, and take an open-top bus ride trough the gorge. So we headed for the car park to wait for the bus, which runs back and forth quite frequently. Naturally, this guided tour isn’t free, but the cost does include entry to the two caves and the little museum as well. The bus turns around at a point a short distance past the touristy area, and allows us to see the stunning Gorge cliff s without the shops and other buildings. At that point, we got off the bus to walk back, visit the caves and generally enjoy the attractions on offer. 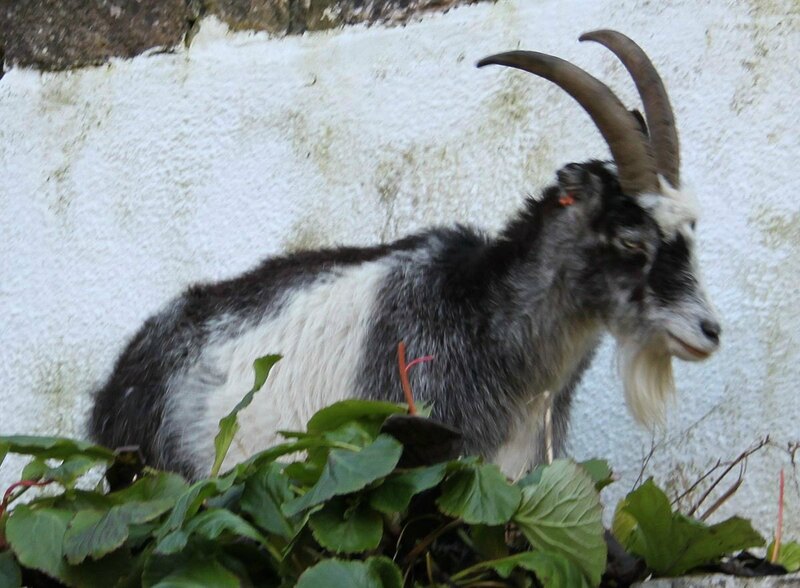 The goats have been introduced as part of a programme to encourage the biodiversity of the area. A flock of feral sheep also graze the slopes. There are also many species if birds, including peregrine falcons, kestrels and buzzards and too many species of flora to mention, other than to say that many are chalk grassland-loving species. We had lunch at one of the many ‘eateries’ . . . The village of Cheddar is the home of the original Cheddar cheese. 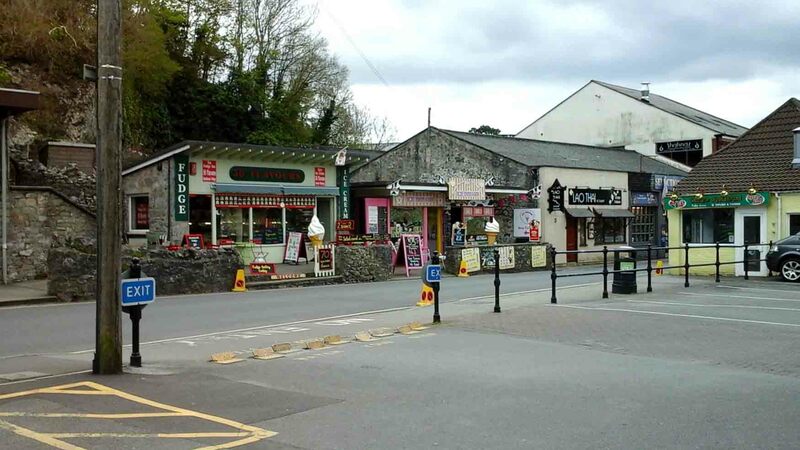 It has been produced here since at least the 15th century (earliest mention of Cheddar cheese in 1170) and left to mature in the caves, with their cool and constant temperatures. 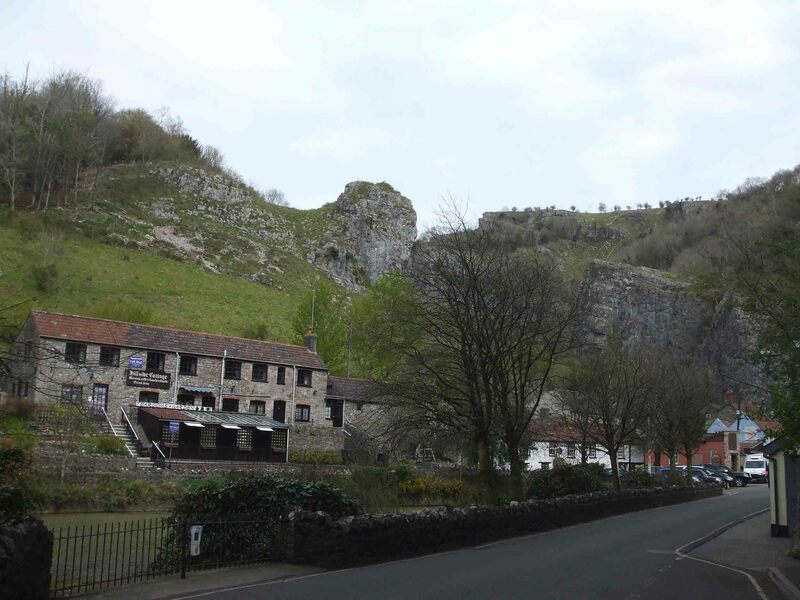 The Cheddar Gorge Cheese Company, unsurprisingly, is located further along the Gorge than we went, and cheeses can still be seen today, maturing inside Gough’s Cavern. Now, Cheddar cheese is made all over the world. And I’m not surprised at that because it’s very yummy! Previous Fancy a Cornish Pasty . . . ? This goes well with my Gruyères post, hahah! Though I do like cheddar much, much more. Great post with so many photos! That lion was amazing. Yes, it does! What a great coincidence. I love all (well most) cheese, but Cheddar is so good for cooking and we have a lot of it in our house. As a vegetarian, Nick eats loads of cheese – and still has a rock-bottom cholesterol level! It’s beautiful Millie. It’s amazing!! I would not have noticed that “friendly lion” if you hadn’t pointed him out, but now it seems so obvious. It’s nice to learn about natural formations, especially if they have some tie to food, ha ha! 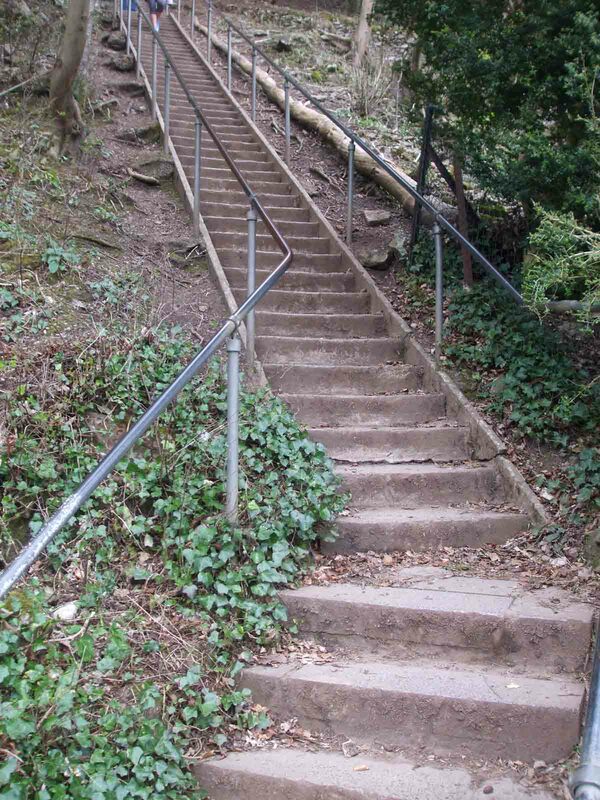 My knees would be protesting those stairs too — not going up so much, but I’d be dreading going back down. The shape of that rock is really great. Once you actually focus on the lion shape, it’s so obvious. It is a lovely place to visit – not exactly the Grand Canyon, but stunning in its own way. My knees protest about going up any steps at all, so by the time we’d done the 274, plus another 90 of the lookout tower, they really didn’t like me very much. The views are worth it, though. Going down, I find OK. The comparison for me was the gorges in upstate New York, particularly the one that runs through the heart of Ithaca. A completely different geography — very deep but very thin, so you’re walking up steps beside a series of waterfalls, and the cliffs are so high and so lushly vegetated on either side that you can’t even tell you’re in the middle of a city. My knee problems have started to limit my adventurousness, which is no good. I just finished two months of physical therapy to help strengthen them, so now I have exercises to do at home before and after such excursions. It sure helps with everyday walking, so I hope I can get out hiking in nature again too. A very yummy post, Millie! What a great tour… I loved seeing the replica of the old Cheddar Man, alongside all the perfect natural lansdscapes… As soon as I read Cheddar, I thought of the Cheddar cheese… and, surprise, you mentioned it by the end of the post… I truly liked this one…. enjoyable and informative, dear Millie… thanks for sharing. Best wishes and happy weekend to you. Looks lovely, I like that sort of scenery with the rocks. 274 steps at that height i would probably pass out. Mine isn’t the knee rather a very unpleasant dislike for very high grounds. I would love to think that would help but the mind does have a habit of pulling up interesting images. I am good with flying to an extent , it does bother me slightly but at least I can close my eyes and not look out. Amazingly beautiful, rich with antiquity and the beauty of another time, Love the photos. Such a wonderful adventure! I had no idea there was a place named after my very favorite cheese (or visa versa). And that the cheese is aged on those very cool caves. I loved this adventure. More cheese,, pleeze! I’m just sorry we didn’t have time to go and watch cheese being in made. It’s produced a little further along the Gorge but we had enough to fit in for one day. Perhaps next time … I have some (not so good) photos of cheese stacked in Gough’s Cave. I’ll post one next time if I can, somehow, reduce the glare form the lights. They sell the cheese at the shop near the entrance to the Gorge. Cheddar is my absolute favorite. Great trip, so much to see. I love the lion and the goats, and the steep cliffs are amazing. Unbelievable what the water can do in million years – change all the geography. The natural shape of that rock, so like a lion, captures everyone’s attention. Thanks, Inese. I didn’t hear about this place, but looks very interesting! As for biodiversity, in the Gorge alone, there are many species of flora and fauna. As you know from your own, extensive travels, people visit places for many different reasons, depending on their interests. 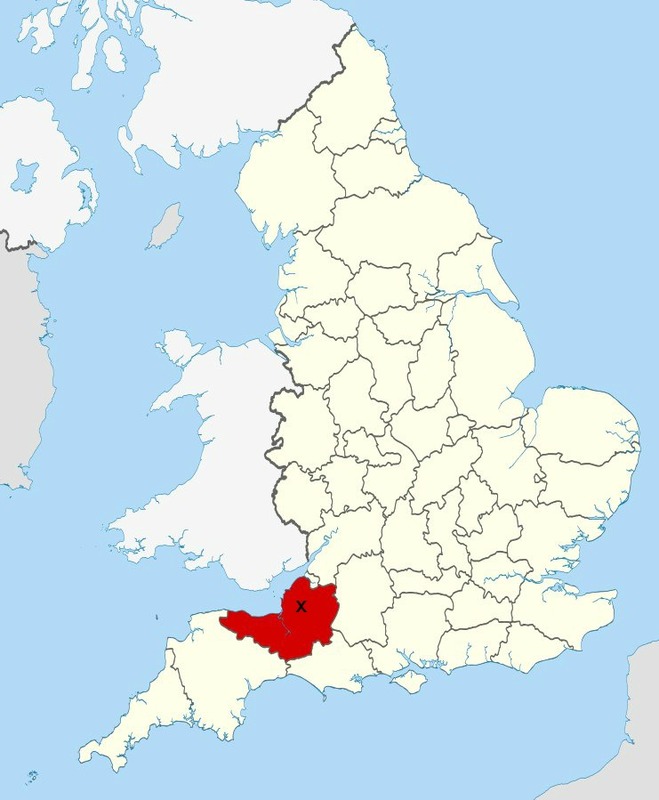 It was my first real visit to Somerset, other than a quick look at Bath some years ago, and we enjoyed visiting many different sites. My reasons for wanting to see the Gorge were both historical and geological, and I wasn’t disappointed in either. I remember Bath the most from that area. The lion definitely looks friendly and appears to have been carved by someone. It reminded me of Narnia. It certainly seems to be an interesting place with added nature’s beauty to it.